It’s a great time to be a kid on Broadway. And there is no better show for kids right now than the relentlessly neon SpongeBob SquarePants, glitzing out the Palace Theatre right in the center of Times Square. If you can manage to squeeze yourself through the crowds and into the front doors, you’ll find that this is no simple theatre. It’s been totally taken over, with sets and tech and lights to rival that of the late Great Comet. Speaking of Comet: now that that show’s gone, SpongeBob probably has the craziest lighting package in all of Broadway. And unlike Comet, they actually use the thing to its fullest extent. Let’s get right to the point: this is a fun show. I’ve never seen a single minute of the Nickelodeon TV show it was based on, but the creative team still managed to craft something that worked for me, and was extremely entertaining. Every number is a knock-down drag-out blast to the finish, and the theatre has more tricks than a David Copperfield show in Las Vegas. Speaking of Vegas, this has the feel of one of those shows, delivering a constant stream of adrenaline to everyone who paid big bucks to be there. But unlike Vegas, this show has a full runtime, a complete narrative arc, and includes a reasonably well-crafted story along with its spectacle. Lighting, production design, costumes and choreography have done a fantastic job here. Every single stage picture is gorgeous, and just about every lighting and projection trick you can imagine is used. It all works in service of the story, and the many messages the musical wants to provide its young and impressionable audiences. Unlike Mean Girls, those messages are not muddled. Everything is laid out simply and clearly, easily digestible by its target age group, and the morals are appropriate and needed. Plus there’s a layer there for adults, with a startlingly on-point (if on the nose) critique of today’s political and environmental climate. The music is merely decent, but that’s all it needs to be. This is basically a rock show, and the spectacle works hand-in-hand with the music and the cast to make the whole thing come to life. The cast album is kind of lackluster, but when you see it live you get it. It’s very, very fun. 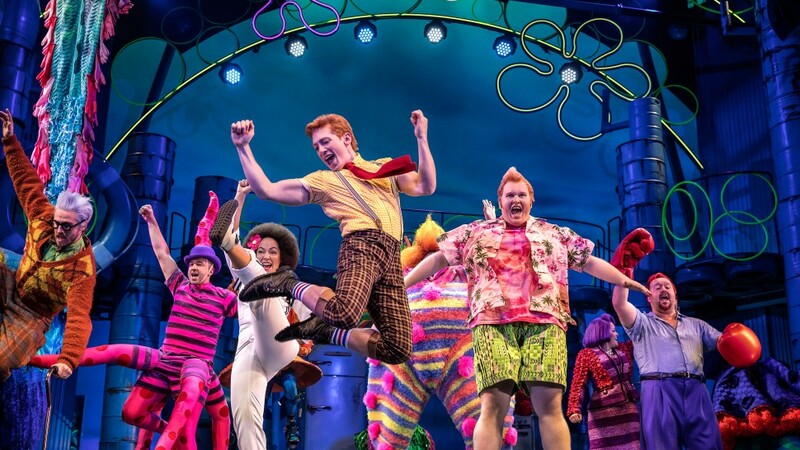 There were three understudies in the performance I viewed, including the lead role of SpongeBob (played in this performance by Curtis Holbrook). He did a fantastic job, although based on the performances I’ve seen from the originator Ethan Slater, he isn’t quite as on-point. The other standout is Wesley Taylor (Sheldon Plankton), deliciously embodying every cartoon villain you’ve ever seen. SpongeBob is a very specific kind of musical, one I’m not sure we’ve seen before. Based on a popular cartoon property, the team made sure to infuse everything with as much as they could from that show. This includes a dedicated foley artist who is integrated into the set and highlighted during one of the songs. He performs hundreds of various cartoon sound effects throughout the show, an interesting touch I haven’t seen taken quite to this extreme before. All of the cast members perform in voices as similar as possible to the characters they portray, making the performance feel like a bunch of over-caffeinated voice actors got together to put on a play. It works, though, and the kids love it. Speaking of the kids—they had a blast. The audience was laughing and clapping along and cheering all their favorite moments and in-jokes. And did I mention the spectacle yet? Yes? Well, let me say it again. This show is going to print money. It grips squarely on its target audience and never lets up, bringing the glitzy glam of Las Vegas to the family-friendly Broadway stage. If you have kids, this is the show to take them to first. They—and you—will fall asleep to Frozen. SpongeBob SquarePants is playing at the Palace Theatre. *My performance was the night of the Drama Desk Awards, so shows were running a lot of understudies. There were three understudies in this performance, including Curtis Holbrook for SpongeBob, Brynn Williams for Sandy Cheeks, and Alex Gibson for Squidward Q. Tentacles. All three did a great job.